Occupancy is already running strong here, and industry researcher PKF Consulting USA LLC is looking for average room rates to grow between 4% and 5% next year. OC’s supply grew this year after the dry spell of the recession. R.D. 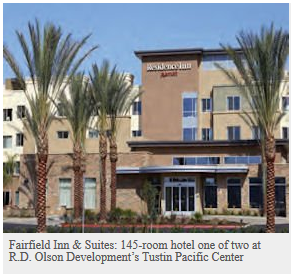 Olson Construction’s 149-room Residence Inn & Suites and 145-room Fairfield Inn & Suites both opened this summer at the developer’s mixed-use project, the Tustin Pacific Center. Two SpringHill Suites—a 172-room property and a 120-room property—are expected to open in the summer in Anaheim. Olson will add a 210-room Courtyard by Marriott in the Irvine Spectrum about the same time. Those will be followed by a 178-room Hyatt Place Anaheim Resort toward year’s end.